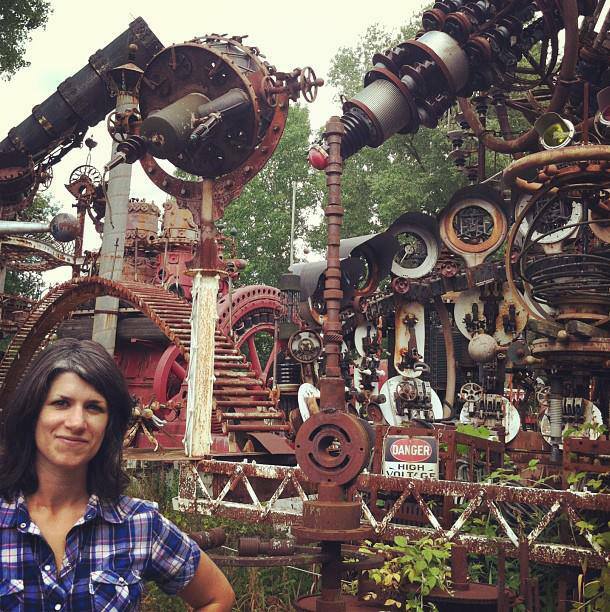 Carla Bruni is an historic preservationist, sustainability and community outreach coordinator, repair clinic hack, and neurotic volunteer. Her goals are a series of moving targets but all seem to revolve around saving things and caring about where you live. Things that are not on her resume include: thrower-outer-of-useful-old-things-to-replace-them-with-plastic-crap, bulldozer operator, and shyster contractor. Carla has a Bachelor of Arts degree in English Literature (Poetry!) from Loyola University and a Master of Science degree in Historic Preservation from the School of the Art Institute of Chicago, where her focus was Greening Historic Homes. Over the past seven years, she has left Chicago to work on hands-on restoration projects in Washington, Idaho, and New Orleans, which she visits to help with hurricane rebuilding efforts any time she has a full tank of gas and a break in projects. Some might say she is downright obsessed. Teaching is the best, so Carla has given academic lectures and workshops on topics including: historically sensitive green retrofits, window repair vs. replacement, traditional restoration techniques for log cabin structures, post-Katrina preservation planning in New Orleans, researching your building’s history, and various cultural history topics. She’s been on historic preservation- and environmentally- focused advisory boards and has been featured in local and national publications, as well as on national television. Yeah, that’s still weird to her. In her spare time, Carla works for free, leaving her no spare time. She has very understanding friends.